“[W]e wanted to set the standard for energy conservation and green building in the museum setting,” said Peter Atkinson (photo 1), the Harvard Art Museums' director of facilities planning and capital management. On an overcast winter afternoon, plenty of natural light still streams through the “Light Machine” into the Calderwood Courtyard of the renovated Harvard Art Museums. While staring through the giant skylight, a visitor might notice that all of the light fixtures in the interior courtyard are turned off. The darkened lights are just one example of how energy efficiency and environmental responsibility were painstakingly considered in the design and construction of the 204,000-square-foot facility. Driven by Harvard’s commitment to sustainability and reducing greenhouse-gas emissions, green building techniques, ranging from super-efficient LED lightbulbs to innovative water-conservation technology, were considered at every stage of the museums’ renovation. That dedication was recently rewarded when the museums achieved LEED Gold certification for the project from the U.S. Green Building Council. Conventional wisdom holds that because of strict temperature and climate requirements for protecting artwork, energy conservation in museum buildings is exceedingly difficult to master. 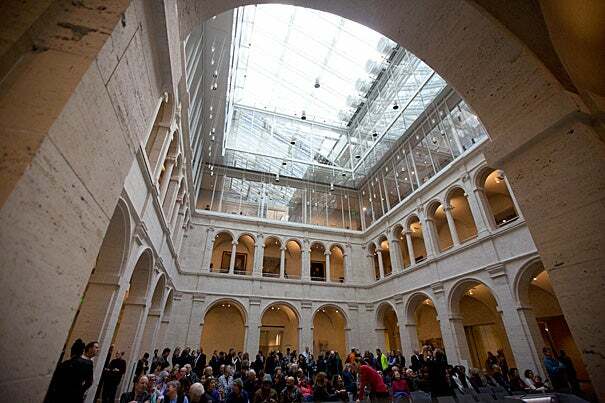 At the Harvard Art Museums, the facilities team welcomed the challenge. The heating and cooling systems include enthalpy wheels that recover energy from waste heat, as well as thousands of sensors that monitor the indoor climate in real time. Additionally, the more than 400 shades that can cover the glass ceiling not only reduce energy use from artificial lighting by flooding the museum with natural light, they are also continually adjusted to help keep the museum cool in the summer and warmer in the winter. “We recognize that we are part of a community that values sustainability. And because of that, we wanted to set the standard for energy conservation and green building in the museum setting,” said Peter Atkinson, the museums’ director of facilities planning and capital management. One of the toughest sustainability challenges that the museums’ project team tackled was deciding what kind of lighting would best display Harvard’s world-renowned collection of artwork. The intention was to use energy-efficient LED bulbs that save energy and cut maintenance costs, thanks to their extended life. Atkinson and his team first partnered with the conservation department to ensure that the new lighting would not impact the preservation of the art, nor how visitors see flesh tones and other colors in the works. After months of testing and careful consideration, the museums installed LED bulbs to light the entire collection, in close to 2,000 fixtures. Not only do the new bulbs provide an even wash of light across the color spectrum, they eliminate the problem of heat stratification in gallery spaces. Conventional incandescent bulbs produce extra heat, creating a “heat cloud” along the ceiling that requires cooling. Because LED bulbs produce dramatically less heat, additional cooling costs have been eliminated. The decision to pioneer the use of LED bulbs on such a large scale has had a ripple effect beyond Harvard. As word spread of their use at Harvard, the University’s vendor reported a significant uptick in requests to use them in museum settings. The new and revamped building was designed with the surrounding natural ecosystem in mind. An innovative water-recovery system collects rainwater from the museums and neighboring Carpenter Center and diverts it to a 10,000-gallon underground cistern. The reclaimed water, which otherwise would be discharged to the surrounding storm sewers at a daily rate of 21,600 gallons, is instead used for irrigation, gray water in toilets, and to recharge the underground water table. Waterless urinals and other water-efficient fixtures further reduce water use inside the museums. It is estimated that as a result of these changes, water use for irrigation will be reduced by 75 percent and in bathrooms by 81 percent. Waste was a serious consideration, especially during the construction process. Ninety-six percent of all construction-related waste and debris was diverted from landfills. Prior to renovation, the art museums donated many of their gallery lighting fixtures, exhibition display cases, and office furnishings to more than two dozen nonprofit organizations, including other museums and organizations on campus. Sculptor and artist Liz Glynn ’03 even used recycled concrete from the renovation to create full-scale replicas of Le Corbusier’s iconic furniture when she returned to campus as the Josep Lluis Sert Practitioner in the Arts at the Corbusier-designed Carpenter Center. The museums’ commitment to sustainability did not end when the final brick was laid. A post-completion commissioning project will continually evaluate and verify the performance of the building’s mechanical systems, while also identifying new opportunities for operational efficiency. “The LEED Gold certification of Harvard Art Museums, especially their path-breaking use of LEDs to light their collection, is a wonderful example of how the University’s commitment to sustainability cuts across every possible space type on campus, from labs and classrooms to dining halls and museums,” said Heather Henriksen, director of the Harvard Office for Sustainability. Students from the Jackson Mann K-8 School and Gardner Pilot Academy in Allston packed Lavietes Pavilion to watch the Harvard women’s basketball team take on the University of Tennessee at Chattanooga.